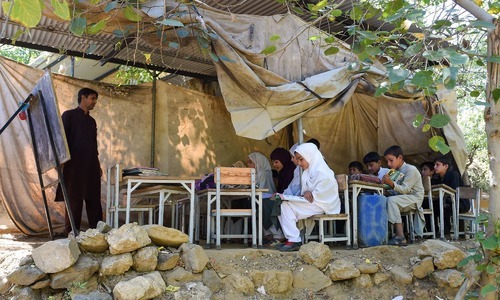 The Balochistan government has stepped up action against 'ghost' employees and chronic absentee teachers to improve the woeful state of education in the province, where over a million children remain out of schools. At least 1,800 state-run primary, middle and high schools in the province have been found to be non-functional. 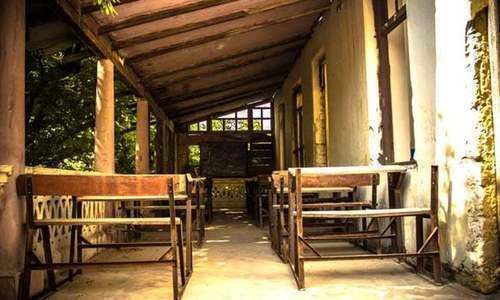 Another 2,200 schools are without shelter and 5,000 primary schools across Balochistan are being run by single teachers, according to documents of the education department obtained by DawnNewsTV. "We have suspended 179 teachers, ordered inquiries against 97 and issued show-cause notices to 82 during the past one month," said Balochistan Education Secretary Tayyab Lehri while talking about the government crackdown on ghost and absentee teachers. The education department has also deducted over Rs141 million from the salaries of chronically absent teachers during the last three years, the documents show. The total number of government-run primary, middle and high schools across Balochistan is said to exceed 13,000. The government has already declared an education emergency in the province to ensure implementation of Article 25-A of the Constitution, which guarantees free education for children aged five to 16. Despite this, however, "Over one million children [in Balochistan] are presently out of schools," Lehri told DawnNewsTV. In order to remedy the sorry state of affairs, the provincial cabinet recently approved the Balochistan Essential Education Service Act, 2018. Under the proposed legislation, teachers will be barred from observing strikes, lock classrooms or boycott classes to have their demands met. The move has sparked a strong condemnation from the teachers' community, who term it a violation of their constitutional and basic human rights. "We will not accept this act since it negates fundamental human rights," Agha Zahir, the chief of 'teachers action committee' told a crowded press conference at the Quetta Press Club. Teachers have also warned they will launch a protest movement to force the government to withdraw the proposed law. Corruption to its superlative limits. The best education will take the socity to next level. The country gives top priority to education system prospers in all the ways. The PTI is suppoed to pay for teachers who don't show up? It is patronage payola. This is no solution to the current woeful state of education in the province. Merit is the only remedy to the desperate academic situation in the province. If the government appoints junior people ignoring the senior ones on the key posts in the prestigious institutions of the province, this sorry state of education will continue to persist. Even it could not spare the results giving institutions like BRCs and appointed junior most teachers as principals on political ground and party affiliation. If the government has such approach towards the education sector, what legislation can it make for its improvement. No teacher has the desire to lock the school and damage career of the students. Protests are always made against injustices of the government. 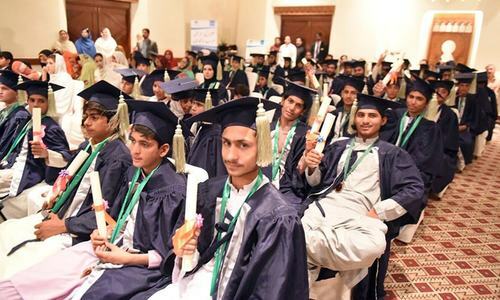 Finally, Naya Pakistan has focus on Education, unlike previous governments. There is education emergency in Rawalpindi, Islamabad universities, let alone the moaning for Balochistan's schools. These ghost teachers will protest for what? Cheating the government, depriving the kids from education and getting paid through dishonesty are no way to be tolerated anymore. Well done.. education is priority. Pathetic This is exactly what Imran Khan needs to working against. Instead HD spends time in big speeches and high level discussions. He should pay more attentions to the needs of the poor and the common man. put biometrics in place like in KP. Government should try to bring more FDIs, create employment opportunities for people who are literate and illiterate and at the same time use media to spread awareness of the benefits of education. If people are poor and jobless they are not likely to send their children to schools because food is more important than education. However, it is for short term for long term it is not. Education can get you a job across all boundaries. I mean to say if you remain illiterate you will just end up in your locality but if you are educated, you can go anywhere to find a job. skill based programs should be initiated by the government for the illiterate people. Education is the best ever thing that the mankind has discovered or invented. It moulds a human being's life from worst to best. Only the educated, intelligent, sane, wise and talented people can understand the value of education. A human being is like gold dust and education transform this dust in a glittering designed ornament. Education makes you self reliance, proud, confident, visionary, smart, and intelligent. It plays a crucial to improve your financial, social, physical, psychological status. It helps you to understand who you are and what you should do. Education is invaluable. Similar was the situation during last survey. Seems no improvement or retrograde movement in this sector. Well done Balochistan government. There may be ghost absentee employees in many other departments who should also be suspended and appropriate amount deducted from their salaries. Pathetic. This is all due to political patronage. No one makes them show up to work and the Balochistan government was able to overstate their number of teachers.